By Xhin, August 22, 2012 in Plugins - Publishing ONLY! This is the plugin I was originally trying to make when I made Self-Negation instead. I make a lot of abstract art, and a while back I discovered a cool technique where you could duplicate a layer, flip it horizontally and vertically, set it to negation, and come up with a cool composite image. This plugin duplicates that technique, except it allows you to adjust the hue of either "layer" and the final hue of the image. This is stuff I do anyway, but it's good to have it all in one package. Anyway, let's see what it can do! Repetitions: The amount of times to apply the effect. This doesn't seem to be that different in amounts greater than 2 (it switches between what 1 looks like and what 2 looks like), so I'll probably fix the way this works in a new version. 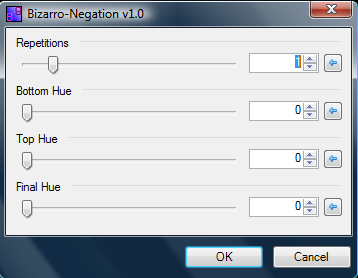 Final Hue: This changes the hue of the composite image when the layers are merged. Note that the plugin isn't actually working with layers; it's just equivalent to them. Set repetitions to "7" because this looks interesting. Same as above, but pulled bottom hue up to 35. Same as above, but pulled top hue up to 341. Same as above, but changed the final hue to 23.